Those familiar with Chanel creative director and ultimate multi-hyphenate Karl Lagerfeld, may not know the designer also a keen cartoonist, but as it turns out, Lagerfeld has actively been commenting on the current political landscape via hazy sketches since 2013. His latest target is German Chancellor Angela Merkel, who he criticizes in a particularly acerbic depiction for the monthly magazine under the daily Frankfurter Allgemeine Zeitung. Lagerfeld is pointing the finger at Merkel's decision to allow one million refugees into Germany as the reason for the rise in the far right Alternative for Germany party, which rose to become the third-largest party in the country after winning almost 12 percent of the vote in Germany's federal elections. 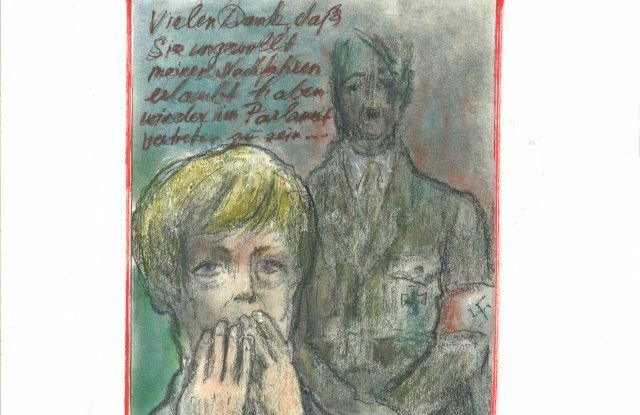 In the sketch Adolf Hitler shadows Merkel, thanking her for the move. "Thank you very much for inadvertently allowing my descendants to be represented in parliament," it reads, while Merkel, hands raised to her face in horror asks: "What have I done?" The legendary designer has been contributing cartoons to the magazine since it's inception in February 2013. When asked about the rise of right-wing populism in his home country, Lagerfeld, who was raised in Nazi Germany said he's "beside himself." "I hoped that something like this would never happen again in my life," he said. "I am ashamed of Germany." Managing editor of the magazine, Alfons Kaiser, described Lagerfeld is a great asset. "His wit is unique," Kaiser said. "His sketches show that he stands in the great tradition of German political cartoons and was influenced particularly by 'Simplicissimus,' the leading German satirical magazine of the pre-war times, which he read as a boy." It's very real out here, team.